New transmitter, receiver, input and output cards, distribution amplifiers, DM Ultra Cable, and 4K/60 Hz scaler grow the industry's first and only complete 4K certified distribution solution. Rockleigh, NJ – The DM 3.0 family of products, the latest generation of DigitalMedia™, continues to expand with more standard-setting 4K products for every room. "The world is adopting 4K at breakneck speed, which is rendering 2K technology obsolete just as rapidly. There's simply no point in purchasing 2K technology any longer," said Fred Bargetzi, Chief Technology Officer at Crestron. "Additionally, we're seeing more and more higher resolution devices, such as 2560x1440 output from Apple® laptops, which require more signal bandwidth than switchers designed for 1080p and 2K distribution can provide. We're shipping the only complete certified 4K distribution solution today, and we're adding more 4K products all time." What makes the 4K DigitalMedia Receiver Room Controller w/Scaler (DM-RMC-4K-SCALER-C) unique is its exclusive scaler chip, developed in-house by Crestron. Other AV companies simply don't have this capability. It can convert any resolution and frame rate to any other resolution and frame rate, up to 4096x2160 at 60 Hz. Both the Wall Plate 4K DigitalMedia Transmitter (DM-TX1-4K-C-1G) and Wall Plate 4K DigitalMedia Receiver (DM-RX1-4K-C-1G) are powered over DM, so all you need is a single cable. Using CEC, many devices can be controlled right through their HDMI connections, eliminating the need for serial cables or IR emitters. Available in both black and white, both devices utilize a standard electrical box for tidy, discreet installation. The 4K DigitalMedia Input Card for DM Switchers (DMC-4K-C) and 4K DigitalMedia Input Card w/Downmixing for DM Switchers (DMC-4K-C-DSP) provide a single DM or HDBaseT input for any DM switcher with modular input card slots, and handles 4K and Ultra HD video resolutions. Available with a DSP for stereo downmixing of multichannel input signals to enable simultaneous distribution of multichannel and 2-channel audio. The 2-Channel 4K DigitalMedia Output Card for DM Switchers (DMC-4K-HDO), shipping Feb. 1, 2015, provides two 4K HDMI outputs and two balanced audio outputs with volume control. DigitalMedia Ultra Cable, Plenum Type CMP (DM-CBL-ULTRA-P) and DigitalMedia Ultra Cable, Non-Plenum Type CMR (DM-CBL-ULTRA-NP) are proven to deliver error-free 4K HDMI signals via HDBaseT over longer distances than other category cables. DM Ultra Cable is the only cable that exceeds HDMI specification, which allows fewer than one pixel error per billion, for HDBaseT distribution of 4K content up to 100 meters. A CAT7a shielded twisted pair cable, it's engineered to deliver optimum performance for 10 gigabit Ethernet; perfect for any application that requires high-performance category cable. The 1-to-2 4K HDMI Distribution Amplifier (HD-DA2-4K-E), 1-to-4 4K HDMI Distribution Amplifier (HD-DA4-4K-E), and 1-to-8 4K HDMI Distribution Amplifier (HD-DA8-4K-E) split one 4K HDMI source to two, four, or eight separate outputs, respectively. "These new products offer further proof that no other solution can compete with the complete package you get with DM 3.0," added Bargetzi. "With DM 3.0 you get the most innovative products, an installed base of millions of HDMI and HDBaseT ports, the most comprehensive training, and award-winning service and support, including our new live online assistance. DM continues to evolve, innovation after innovation." 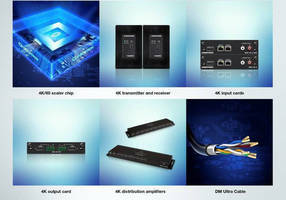 Crestron will be introducing even more DM 3.0 4K products in 2015, further cementing its position as the only complete 4K certified distribution system. To get all the latest news, information and product updates subscribe to our blog, "Like" us on Facebook®, follow us on Twitter®, and connect with us on LinkedIn®. For more than 40 years Crestron has been the world's leading manufacturer of advanced control and automation systems, innovating technology and reinventing the way people live and work. Providing integrated solutions to control audio, video, lighting, computer, IP and environmental systems, Crestron streamlines technology, improving the quality of life for people in corporate conference rooms, hotels, classrooms, auditoriums, and in their homes. Crestron's leadership stems from its dedicated people who are committed to providing the best products, programs and services in the industry. In addition to its World Headquarters in Rockleigh, New Jersey, Crestron has sales and support offices throughout the U.S., Canada, Europe, Asia, Latin America and Australia. Discover the world of Crestron by visiting www.crestron.com. All brand names, product names, and trademarks are the property of their respective owners. Certain trademarks, registered trademarks, and trade names may be used in this document to refer to either the entities claiming the marks and names or their products. Crestron disclaims any proprietary interest in the marks and names of others. Crestron is not responsible for errors in typography or photography.